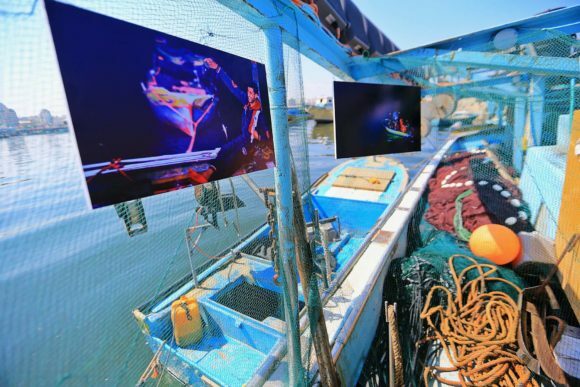 A young Palestinian photographer in Gaza exhibited his work last week in a location that highlights both the ancestral food cultures of the Strip as well as the daily threat posed by Israeli siege and occupation–a Palestinian fishing boat in Gaza City’s harbor. 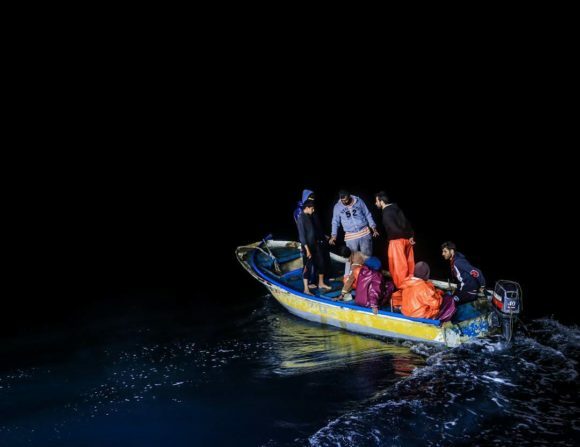 Khalid Hashem Abu al-Jedian’s photographs were taken as he accompanied the fishermen of Gaza on their hazardous daily journeys into the sea, where Gaza’s traditional fishery is boxed in on all sides by Israeli siege, enforced by gunships. When Palestinian fishermen go out in the morning to cast their nets, they face arrest, confiscation of their boats or even severe injury or death. While the Israeli occupation navy rotates the boundaries of the Palestinian fishing zone under siege at 3, 6 or 9 nautical miles (all well below the 20 nautical miles set in the 1993 Oslo Accords as the fishing zone for Palestinian fishers from Gaza), even fishing boats within that zone have regularly come under live fire, as documented by the Palestinian Center for Human Rights. In 2016 alone, Palestinian fishermen were fired on 126 times by Israeli naval ships. 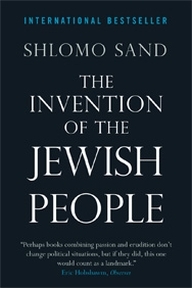 In 2000, Gaza had about 10,000 fishermen. Today, the number has been reduced to approximately 4,000 registered fishermen, who are breadwinners for 50,000 people. In a report, B’Tselem says even this figure is misleading since half of the registered fishermen are unemployed due to an inability to repair damaged boats. The raw materials are unavailable due to the siege. The richest fishing stocks are in the areas of the sea to which Palestinians are denied access. Combined with the effects of water pollution and overfishing as a result of confinement, Palestinian fishermen’s take from the sea is highly limited, rendering their profession far less sustainable than in years past. Tens of millions of dollars in income have been lost due to siege, with resonating effects for fishers’ families as well as for Palestinians in Gaza generally, who face increased food insecurity due to occupation attacks on farmers and fishers that have significantly cut access to fresh fish in Palestinians’ diets. 95 percent of Palestinian fishers in Gaza live below the poverty line. 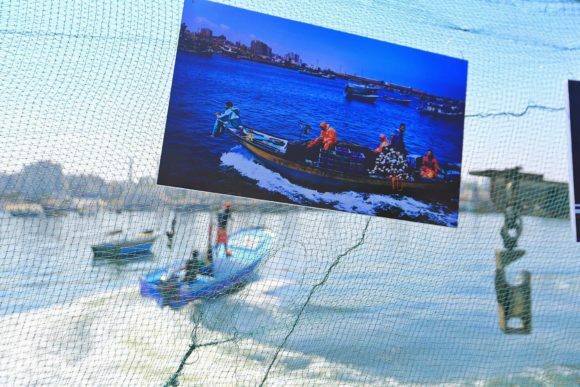 Abu al-Jedian’s exhibition, entitled “Sounarah,” or “Net,” displayed scenes from Palestinian fishery hung on nets surrounding a traditional fishing boat in the Gaza harbor. Visited not only by students and artists but also by fishermen themselves, the exhibition highlights the daily dignity of work on the fishing boats, a practice handed down through generations but endangered due to the severe attacks on the fishing industry. The fishers featured in the exhibition included elders over 60 as well as children under 10, struggling to survive in an industry decimated by siege. 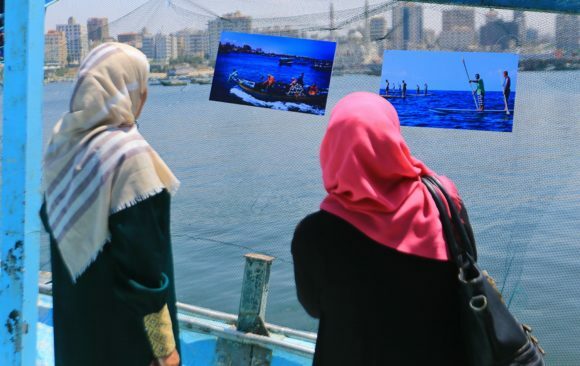 “I chose the situation of the fishermen as the subject of my first exhibition because the Palestinian fishermen are in a constant clash with the occupation authorities, who impose maritime borders that prevent the fishermen from crossing them to do their work. 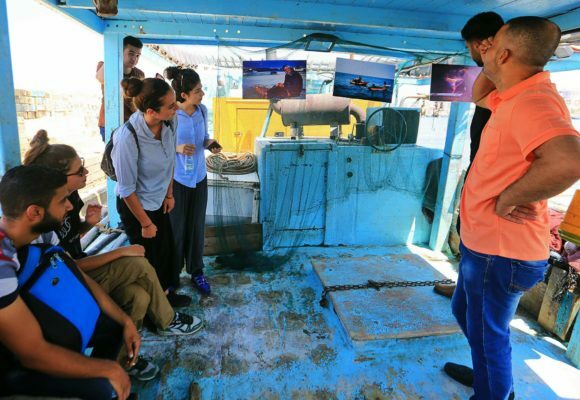 And then, the Israeli occupation continues to violate the rights of the fishermen even within the so-called permitted and designated area,” says Abu al-Jedian. The photographer’s stunning work captures protests, street scenes, markets and daily life on the streets of Gaza, yet he specifically selected the struggle of the fishermen for his first public exhibition. All of his work is saturated with brilliant colors, and this is no exception in the case of his photography highlighting the fishers of Gaza. 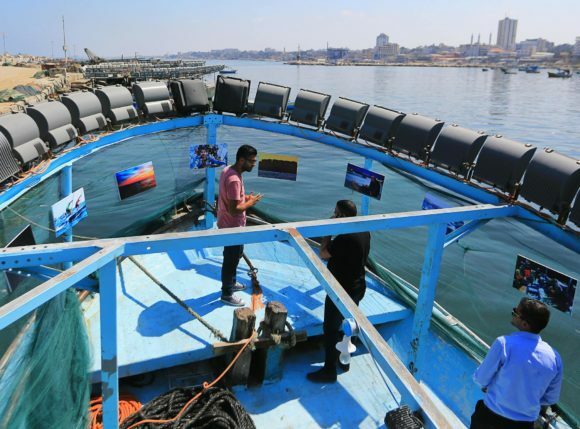 From the labor of fishing boat workers in the dark pre-dawn hours to the brilliant sunlight on blue fishing boats in the sea, Abu al-Jedian’s work shines with artistic inspiration as well as commitment to reflect the experience of Palestinians today. The economic cycle of siege has a further impact on Gaza’s fishery. Fuel to run the fishing boats can be extremely expensive, taking money from the nonexistent poverty-level budgets of Gaza’s fishing families. The generally high levels of unemployment and denied payments throughout the strip mean that families have little income from which to purchase Gaza’s fish, even when fishers are able to return with a small catch from the 6-mile fishing zone. Abu al-Jedian notes that his photography is not mere documentation but also an appeal against injustice. 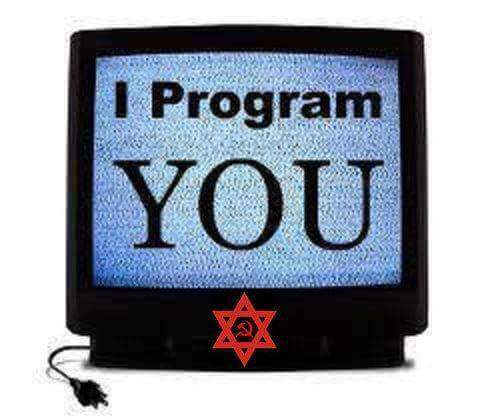 “My goal as a Palestinian journalist is to convey the suffering of my people. Palestinian fishermen are being subject to continuous violations. While the world thinks of fishing as a profession practiced on the waters of the sea, in Gaza this journey is covered with blood and threatened with death. The fishermen’s livelihood is stolen by the occupation navy and no one guarantees or protects their lives. Where is our right to work? Where is our right to live?” he asks. Organizations like the Union of Agricultural Work Committees work to organize the fishermen of Gaza to demand access to the sea and to support each other. 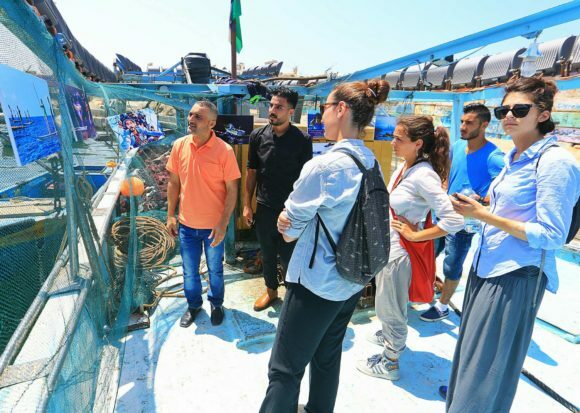 UAWC helps fishers to represent themselves and to provide repair equipment and replacement boats and engines when fishermen are attacked by the Israeli navy. The loss of a boat or an engine can be an insurmountable financial catastrophe for one of Gaza’s fishing families. 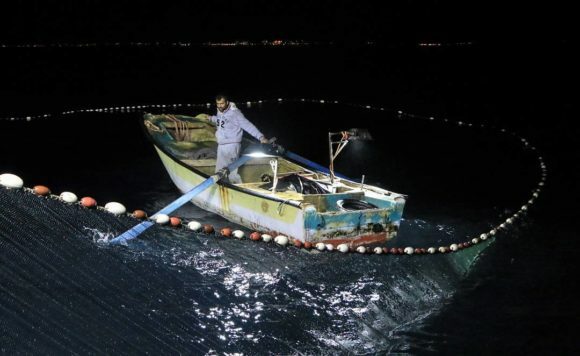 For its work to defend Palestinian fishers and farmers throughout occupied Palestine, the UAWC – like other Palestinian and international NGOs and workers operating in Gaza – has been subjected to a campaign of harassment around the world by far-right Zionist organizations like Shurat Ha-Din and NGO Monitor, in an attempt to stop international support for the UN-honored organization that helps to keep Palestinian fishers afloat and farmers on their land. Abu al-Jedian emphasizes the importance of international support, not only for the Palestinian fishers of Gaza, but for the Palestinian people overall. “My message to all the people of the world is to see our people’s hopes and dreams to live a decent life like any other human being in the world – without continuous humiliation, occupation, killing or siege restricting our movement, worship, trade and all means of life.” The Freedom Flotilla Coalition, the international coalition that has organized multiple siege-breaking boat journeys to the Gaza Strip, has launched a project called the Solidarity with Gaza Fishers campaign, hoping to highlight these frontline workers facing siege on a daily basis. 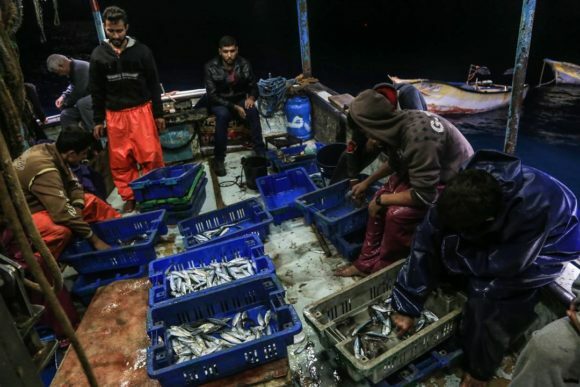 The losses facing Gaza’s fishers are far from restricted to the economic realm. In 2016 and 2017 alone, dozens of Palestinians have been arrested while many more have been injured by Israeli occupation naval forces off the coast of Gaza. These fishers are often injured when they are forced off their boats and into the water, injuries that can include knee and leg wounds that make it difficult to resume their profession. 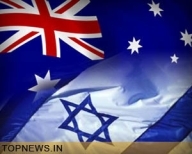 Some are interrogated and released from Ashdod, while others can be brought before Israel’s infamous military courts – with a 99.74% conviction rate for Palestinians – and face charges of “support for” or “membership in” one of Palestine’s major political parties. 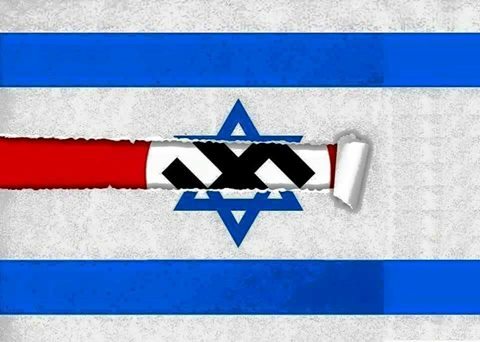 May 15 of this year marked Nakba Day, when Palestinians around the world remember the expulsion of over 700,000 Palestinians from their homes and lands by Zionist militias to create the Israeli state. 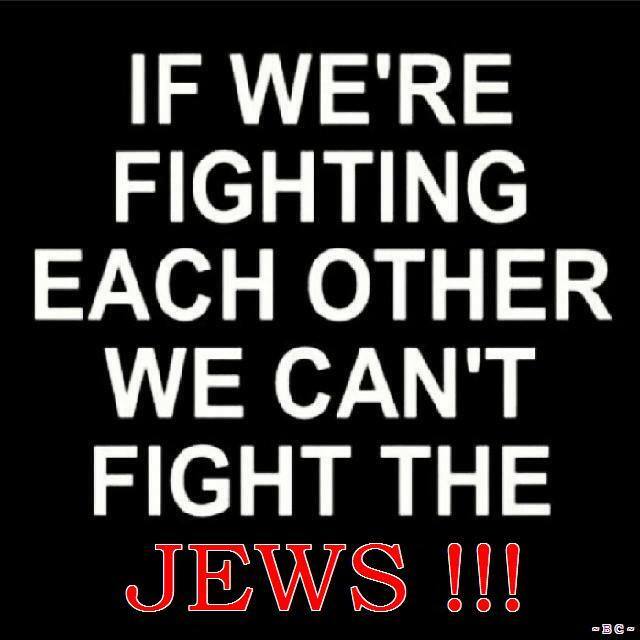 Seven million Palestinian refugees continue to be denied their right to return to their homes and lands – including the 70 percent of Gaza’s population who are Palestinian refugees. It also marked the killing of Palestinian fisherman and refugee Mohammed Bakr, 28, by Israeli occupation forces. From Gaza’s Shati refugee camp, the Bakr family is one of Gaza’s large fishing families. That day, the Nakba was marked by the seizure of several Palestinian refugees and the confiscation of the fishing boats that keep their families alive at the hands of today’s Israeli military. 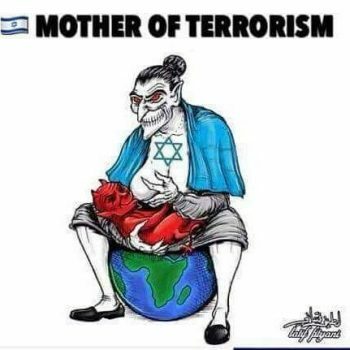 The Israeli occupation navy that presents this threat to Palestinian fishery–and to the entire Palestinian population–is provided with IT infrastructure and support through a contract with Hewlett Packard Enterprise or its successor corporation, DXC Technologies. While these corporations have split from HP Inc, the well-known vendor of personal computers, laptops, printers and ink, they continue to share resources and the Palestinian Boycott, Divestment and Sanctions National Committee has urged a global boycott of HP. In fact, the Israeli Navy stepped up its intensified siege on Gaza in 2007, only one year after HP began its contract to “virtualize” the Israeli Navy. A growing number of churches and labor unions have begun to declare themselves “HP-free zones” in response to the company’s contracts with the Israeli occupation military, prison system, and repressive apartheid ID card infrastructure. Khalid Hashem Abu al-Jedian’s work can be followed on Instagram at @khalidhashem70. The Facts:This article was written by Lyn Redwood, R.N, M.S.N., President of Children’s Health Defense.